Berlin´s 27th Lesbian and Gay City Festival will be on July 20 and 21, 2019. Under that slogan Berlin´s Regenbogenfonds e.V. 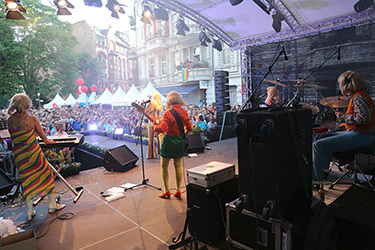 will present its 27th annual Lesbian and Gay Festival - Europe's largest. As usual, it is being held at the traditional gay stomping ground around Nollendorfplatz in Schöneberg. Daily from 11 am the 6 Festival-Worlds: »World of Film«, »World of Politics«, »Positive World«, »World of Radio«, »World of Sports« and »World of Wellness and Health« are presenting themselves on 20.000 m² at the Motz-, Eisenacher-, Fugger- and Kalckreuthstrasse as well as a wide range of lesbian, gay, bisexual and transgender projects, groups and organisations. On this giant open air amusement every year the LGBT*-scene shows how to have fun with each other. With over 350.000 visitors from all over the world it is truly the biggest event of its kind. Snacks, drinks, the music from the 5 stages: »98.8 KISS FM« B with the beat of Berlin, the »Connection-stage« D with house and techno music, the »WomenLesbianTrans*stage« C, »Queer Media« E with a mix of lesbian and gay entertainers and DJs and »sunshine live« F -electronic music radio- are for sure outstanding. One of the absolute highlights of the festival is the celebrity talkshow »Das wilde Sofa« (The wild sofa) on the »Stadtfest-stage« A at the corner of Eisenacher Strasse and Fuggerstrasse. Gerhard Hoffmann and his charming assistants Tilly Creutzfeldt-Jakob and Giselle d´Apricôt will put their guests from politics and culture to the acid test on Saturday from half past 3 to half past 4 pm. Afterwards there will be a colorful program from rock to pop on staurday until 11 and on sunday until 10 pm. Over 100 projects from all over the world, organisations and parties will take part and make it the biggest showcase of the community!